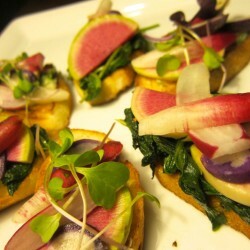 Radishes. I love them, root to leaf, and it is one of the vegetables I munch on all year long. My radish horizons have been greatly expanded in recent years. 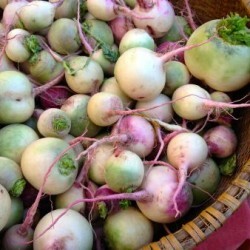 Beyond the traditional red (globe) radish, they also come in purple, black, white, French breakfast, and watermelon varieties, with varying heat. And lucky me! I can get most of these all year long from the seasonal and winter markets here in Boston. Thinly slice a selection and serve with herb butter on crostini and you’ve got a fabulous French-insprired treat, a favorite at my home. Or sauté up the leaves to include in a glorious winter-themed dish like seared scallops, radish greens, and winter squash purée. Truth be told, today’s salad grew out of a garnish, of all things. I had prepared a sesame-crusted tuna with satay sauce for the “Under the Sea” challenge on The Taste and needed acid and crunch to balance the dish. This mixture definitely fit the bill. Yet it’s so simple and satisfying that I developed this recipe starring the glorious Raphanus sativus. Very little to do here, friends. In a small bowl, whisk together the fish sauce, brown sugar, and water. Taste. Add the radishes, scallions, and cilantro. Toss and retaste. You’ve now got a deliciously light salad that can also be used as a base for fish (or whatever). For a dressing with a bit more body, simply include a teaspoon or two of peanut or sesame oil and a squeeze of lime juice or rice vinegar. If you do add oil and acid, just whisk them in to suit your own palate. It’s your salad, after all. Spoon artfully on a plate to serve. 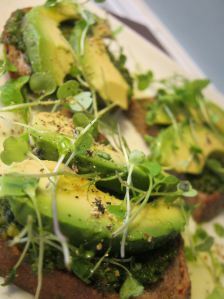 Sprinkle with toasted sesame seeds and zest with fresh lime. Season with salt and pepper, as desired. Quick. Easy. Pretty. Crunchy. Flavorful.